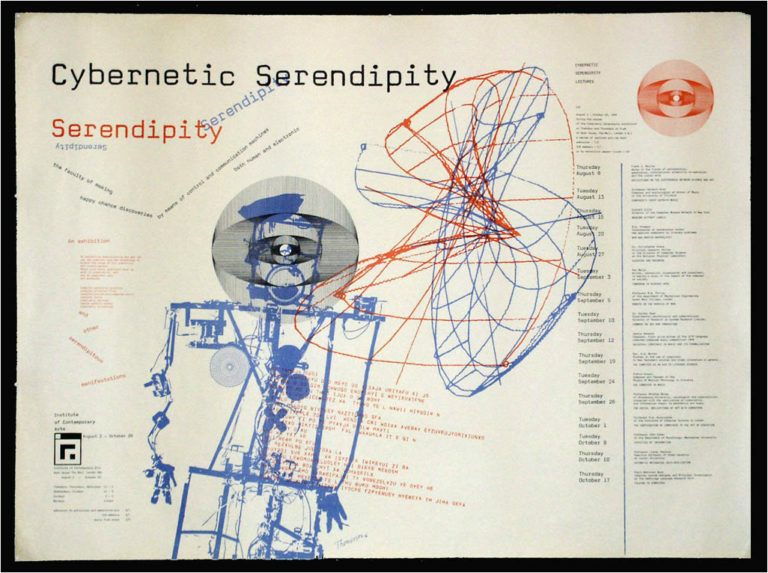 Poster for "Cybernetic Serendipity" exhibition at London's ICA in 1968. In a 2001 text, the French collective Tiqqun professed that the cybernetic paradigm of “steering” introduced after the WWII in US and other overdeveloped countries became not only a new political metaphor but a new paradigm for how all human life. Cybernetic management became a new ‘general fable’ for human life-worlds: all biological, social and physical behaviour became a subject of inquiry and manipulation as fully programmed and reprogrammable. In this seminar we will explore the parapolitics of art and culture after the declared ‘end of ideology’ in the 1950s. We will explore the tensions and possibilities rising from exchange between mimesis and abstraction as two seemingly opposing regimes of visual coding, of ‘programed’ art and of exhibition form as a ‘message’. In this seminar we will read together selected segments of Norbert Wiener’s ‘The Human Use of Human Beings’ in parallel to Tiqqun’s ‘Cybernetic Hypohesis’ and fragments of Katherine Hayles: ’How we Became Posthuman’ but use the readings primarily in order to analyze several seminal curatorial and artistic projects such as the ‘A Communications Primer’ (1953) by Charles and Ray Eames – based on Claude Shannon’s ‘The Mathematical Theory of Communication’ (1949), collective experiments with ‘rational approach’ by the members of the protoconceptualist group Gorgona (1959-1966), as well as a selection of exhibition projects such as the ‘Didactic Exhibition’ (1957), NT4 (1968), ‘The Cybernetic Serendipity’ (1968), and ‘The Machine as Seen at the End of the Mechanical Age’ (1969). Participants are expected to prepare short presentations of selected exhibition projects and participate in class discussions. Tuesday, June 04. 16:00-19:00 / Room n.n. Wednesday, June 05. 10:00-14.30 / Room n.n. Please contact Antonia Majaca (antonia.majaca [at] gmail.com) and Ariana Dongus (adongus [at] hfg-karlsruhe.de) to register for the class. This seminar will explore the relationship between gender and learning machines. We will start by exploring the modes in which gender is inherently ‘inscribed’ in the technological systems of AI, and ask how gendered binaries are fundamentally implicated in the genealogy of the ‘Entscheidungsproblem’ and how they are continuously reproduced by the AI computational systems. We will think through the crucial implication of the paradigm of incomputablity introduced by Alan Turing in 1936. If incomputability revealed not simply the ‘crisis of reason’, but also demonstrated that reasoning had to include the unknown within the procedure of thinking, what are the ramification of the paradigm of incompatibility on the ‘universal subject of western knowledge’? How does incomputability destabilise not only the axiomatic historical and epistemic schemes and what does it ‘do’ to the political aspects of its ‘truth production’? If the Universal Turing Machine demonstrated not only that truths could become machine-programmable, but, crucially, that computational procedures could lead to conclusions not contained by the premises, it also opened a way of updating ‘rational thinking’ with and through machines. In this seminar we will consider AI as ‘technological research entities’ modelled upon diverse aspects of human intelligences and consider the notions of randomness, uncertainty and incomputibility in diverse fields to arrive at a sketch for a differentiated and reparative feminist epistemology and aeshetico-political project of AI. With it, by way of theory and examples from contemporary art, we will examine not only the norms and protocols of Western rationality – together with its apparent ’gender blindness’ and its claims of neutrality, but also try to think beyond its contradictory hegemonic (binary) cultural logic of intertwined techno-euphoria and techno-paranoia. Participants are expected to prepare short presentations of selected artworks and texts and participate in class discussions. Tuesday, June 12. 16:00-19:00 / Room n.n. Wednesday, June 13. 10:00-14.30 / Room n.n.